The Lipedema Foundation Brochure features key questions that patients may have about lipedema. If you would like hardcopies of the brochure, fill out this form and include an address and quantity. There is a patient advocacy group called FDRS. They host annual patient conferences that bring the latest news to all. FDRS's temporary website contains a lot of information. Their old website had more information and must be accessed through the Google WayBack machine currently. Their Facebook Page contains announcements and their Maillist announces important happenings. 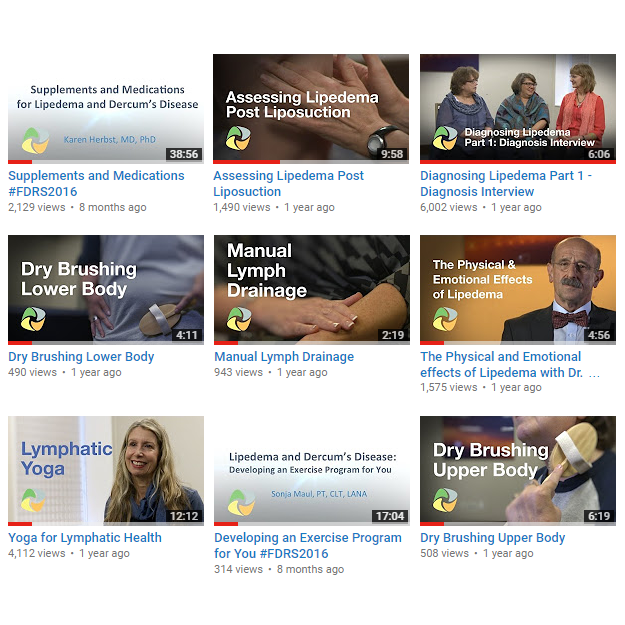 FDRS's YouTube channel has videos, including diagnosing, conference talks, and self-care tools. Start with the Primer and Diagnosing Part 2 videos. Their Treatments Diagram is an especially useful tool to show what patients can do for themselves while waiting for diagnosis and treatment. Created in partnership with the Milken Institute's Center for Strategic Philanthropy, the Giving Smarter Guide for Lipedema outlines the current epidemiology, health burden, diagnosis, and treatment procedures for lipedema, and identifies key research opportunities. Two good educational materials out of the UK include a physician training course, Early lipoedema diagnosis and the RCGP e-learning course, and the UK Best Practice Guidelines: The management of lipoedema 2017. The Dutch published their Lipedema management Guidelines in Netherlands in 2014: Guidelines in the Netherlands and here is the Patient Version. The German Guidance Detailed View Lipedema was published in 2015: German page; Google Translate to English version of short guidelines; Google Translate to English version of long guidelines. The University of Arizona TREAT Program has developed CME. FDRS offers free enduring Continuing Medical Education (CME) for Providers based on their 2016 and 2017 conferences. The University of Arizona TREAT Program has published their TREAT Medications and Supplements list which identifies medications and supplements that support people with lipedema and lymphedema. The Lymphedema and Lipedema Nutrition Guide book is an amazing, well-researched resource that helps people identify practicable changes to eat healthier foods that support people with lipedema and lymphedema. Chef Michele Ligouri has put together a set of recipes that tries to follow the guidelines in the book and is aimed for a busy family with divergent health needs. Several FDRS YouTube videos discuss multiple nutrition plans, including RAD, Ketogenic diets, paleo and others. The Photo Gallery of Lipedema patients has about 500 photos displaying the effect this disease has had on many bodies and some of the many variations in these diseases. There are many private Facebook groups, and we highly recommend joining some of them to ask your questions there, especially where to find caregivers close to you. Go to Facebook and search on Lipedema and Lipoedema. The best large group is the Lipedema Sisters USA group. 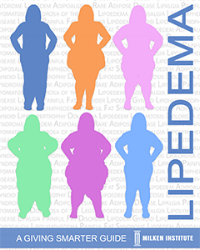 See our About Lipedema page. In order to receive notifications of new information, videos and conferences, be sure to Like us on Facebook, Follow us on Twitter, Subscribe to the FDRS YouTube channel, and join our Maillist.